Preheat your oven to 375°. Make small incisions [about 2 inches each] all over the lamb. Insert a few rosemary leaves and a sliver of garlic into each incision. In a small bowl, combine the salt, pepper, thyme and olive oil. Rub this mixture all over the lamb. Place the lamb in your dish and scatter the whole garlic cloves around the lamb. Roast for 30 minutes. Meanwhile, prepare your artichokes. Add your cut artichokes to a bowl of water and the juice of your lemon. Bring a large pot full of salted water to a boil. Drain the artichokes and add them to the boiling water. Cook for about 3 minutes, then drain and set aside. Remove the your dish from the oven and turn the lamb. Cook for 15 minutes. Turn the lamb again and cook until it's medium-rare, about 35 more minutes. About 20 minutes before the lamb is done, scatter the artichokes around the lamb and roast until tender. 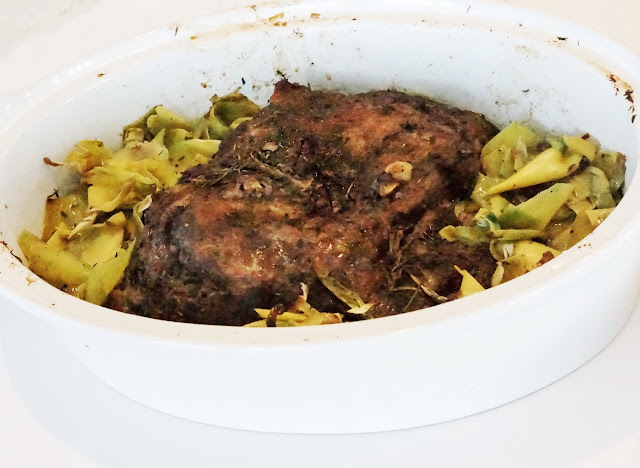 Transfer the cooked lamb and artichokes to your serving dish. Pour the juices from your roasting pan into a sauce pan. Stir in the wine and beef stock until the liquid starts to thicken. Add salt and pepper to taste. This was surprisingly not hard to make and will really impress your guests!